It has been a rough week for global equity markets. 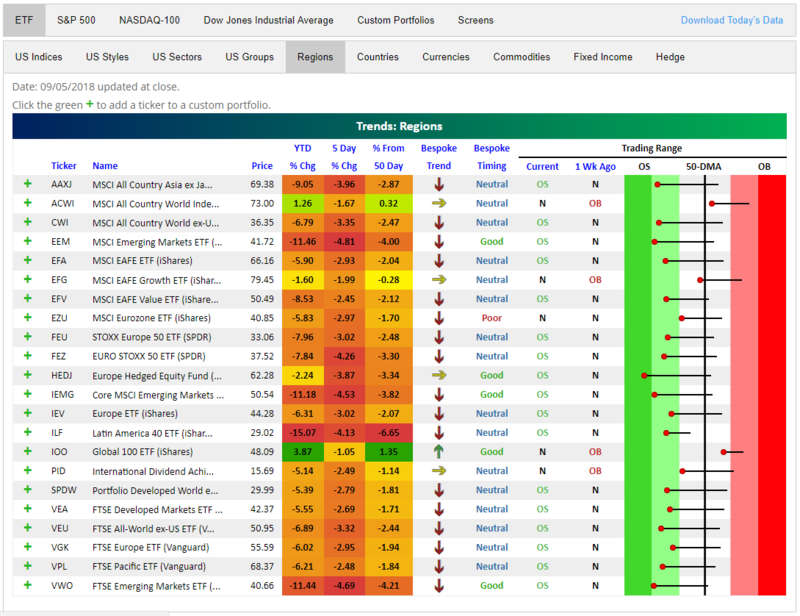 Below is a snapshot of recent action across regional equity ETFs using our popular Trend Analyzer tool. The Trend Analyzer is available to Bespoke Premium and Bespoke Institutional subscribers. There is red shading all over in the snapshot, indicating weakness both on a near-term and longer-term basis. Last week at this time, most of these regional plays had recovered above their 50-day moving averages, but a sharp sell-off since last Wednesday has left just two ETFs above their 50-DMAs. These two ETFs are the only ones that include US equity exposure. After 3-4% declines over the last week, almost every ETF is now back in oversold territory, with many at extreme oversold levels (dark green shading). From a longer-term perspective, you can also see that our proprietary Bespoke Trend ratings shows downtrends nearly across the board. On both an absolute and relative (to the US) basis, the year just keeps getting worse for international equity markets. You can learn more about our proprietary Bespoke Trend and Bespoke Timing rating system at the bottom of our Trend Analyzer page.